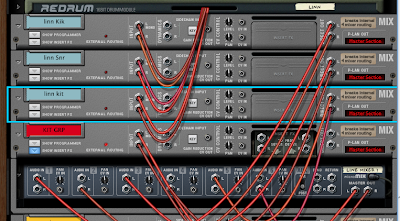 I was playing around with Propellerheads' excellent Record and wishing there was a way to create mixer subgroups for the drum kit when I had a bit of a brainwave and realised that you can. 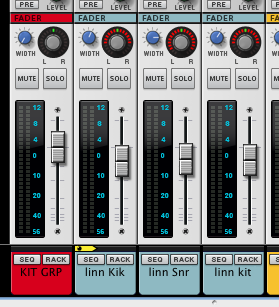 You need to take the direct outs from your mixer channels and add them to another mixer inside mix channel. It's easier if I show you..
Three channels, kick, snare and kit all have their direct outs sent into a separate mix channel with a 6:2 mixer added as an insert effect. The master out of the 6:2 line mixer goes into the input of the mix channel. I've put each left, right output in it's own channel panned hard left and right. So now you have a dedicated channel to mix the volume of your three kit channels. Oh, note. Make sure you turn the width to zero, else you'll only get a mono mix.